Vivex TUV 5060 is the latest generation of UV-LED inkjet printer offered by us. Equipped with industrial high-resolution DOD piezo electric grayscale printheads, 5060 delivers vivid colors and fine details, and at the same time, works seamlessly with professional ColorPRINT RIP and color management software. With rapid curing UV inks and without the need to use plates, 5060 efficiently satisfies the needs of short runs and on-demand printing. 5060 is the best solution for just in time signage, safety signs, warning signs,personalized souvenirs, customized gifts, trophies and special promotional materials. 500 x 600 table size. A high precision rotary encoder ensures extremely accurate media-table feed. for producing super sharp images with much smoother gradients. white out of images, or printing white as a spot color. Automatic safety detection of media thickness. guitar decoration and almost anything else you care to imagine. under, over in between, alpha channel and spot. The TCL Bulk Ink system ensures costs are minimized. may also be utilized. The production sequence can be varied to suit your requirements. Front loading and unloading, Front Loading with rear unloading. 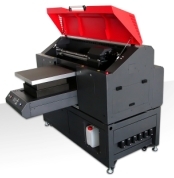 This is no light weight desktop printer, 580kgs makes it a very substantial unit. Equipped for serious production with 6 high speed high resolution print heads. 500mm x 600mm print area. With 600mm loading and unloading zones. A Bulk Ink System, no expensive cartridges. All Steel and Aluminium construction.